Map Test aims at cognitive capabilities and awareness. 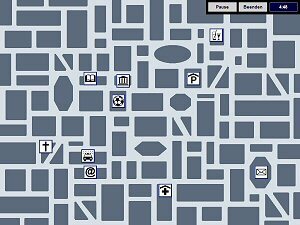 At the beginning of each run you are made familiar with symbols representing civic institutions like hospitals, airports and graveyards. A map indicates the location of these facilities then. You are to memorize the location of each institution. In the next step, the map is shown without facilities and program will ask you to indicate location of several institutions.